Turn down your tinnitus volume. AudioNotch is software that creates notched sound therapy to treat tinnitus. What is Notched Sound Therapy? For most people, tinnitus is a sound mistakenly created by their brain. This usually happens because the brain attempts to adjust for hearing loss. "Notching" sound lowers the volume at a particular frequency. Notched Sound Therapy is audio that is "notched" at your tinnitus frequency. Notched sounds help reverse your brain's adjustment error. As a result, Notched Sound Therapy can lower the volume of your tinnitus. For a full explanation of the science, click here. 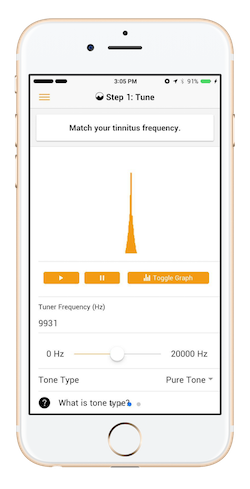 Use our tuner to match the frequency of your tinnitus tone. The tuner is free to use on both our website and our app. 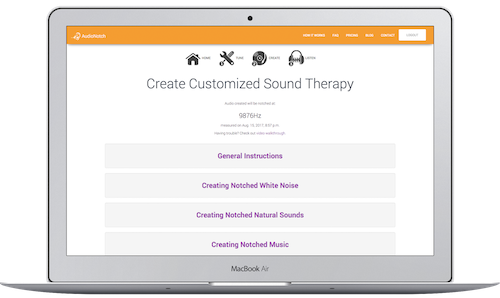 Create "Notched Sound Therapy" using our preset sounds or your own music. AudioNotch "notches" this audio for you. Listen to your "Notched Sound Therapy" daily. Over weeks to months, your tinnitus volume should decrease. You can listen to your therapy wherever you want. AudioNotch has an unconditional 30 day money-back guarantee. Simply e-mail us to request your refund, and it will be granted. Notched Sound Therapy is a new tinnitus treatment pioneered by European researchers. Experiments have found average volume reductions of 75%, 26%, 20% and smaller. AudioNotch creates Notched Sound Therapy that is customized for your unique tinnitus frequency. If you want to listen to your own music, we can process it into Notched Sound Therapy. Access the AudioNotch web app from a computer or phone with internet access. Detect your tinnitus frequency, and create and listen to Notched Sound Therapy. Download the AudioNotch mobile app for your iOS or Android device. It syncs with our web app, so you can access the same features and notched sounds. Access to AudioNotch software comes with unlimited email technical support at support@audionotch.com. Note: we do not provide medical advice or evaluations via email. Listen to your therapy through an internet connection or download your therapy files and bring them anywhere. AudioNotch is a web application that can be accessed from any device with an internet connection. Using a PC or Mac, you can create your own custom Notched Music Therapy from MP3 format audio files by uploading audio and processing it. You can also download your therapy as MP3 format files and transfer them to any device, such as a computer, smartphone, tablet, or MP3 player. AudioNotch also features a mobile app, available on the iOS App Store and the Google Play Store. It works as your companion on the go, featuring a tuner, notched white noise and natural sound creator, and a listener that syncs with your entire AudioNotch library. AudioNotch stores your sound therapy and tone history, so you can access it anywhere, anytime. Access your sound therapy online and offline with computers, phones, tablets, and MP3 players. Download your therapy files and bring them anywhere. No DRM, no restrictions. It's your property, forever. Getting bored of listening to the same therapy songs or audio? Don't worry - make as much as you want. "I went from a 9 to 2 within 4 weeks of using AudioNotch"
I've been using AudioNotch faithfully for 2 months and have had substantial reduction in tinnitus in one ear and am hopeful to have some relief in the other. After suffering for 7 years with this ridiculous hearing issue I'm so grateful to have found AudioNotch. "I have experienced a noticeable reduction in my tinnitus volume"
I have been using the AudioNotch tinnitus therapy for three weeks. I prefer the white noise therapy as it allows me to work at the same time with minimal distraction. I have experienced a noticeable reduction in my tinnitus volume. Needless to say, I am more than happy with the results to this point. I sincerely hope others can benefit from the information and specific guidance and tools provided by AudioNotch. "I recommend the program to anyone who has tinnitus." I've had tinnitus for most of my adult life - now 69. I've been using your program (off and on, depending on circumstances) for 5 years. We recently moved to NYC from Florida and I didn't have the time or patience to listen to the therapy. Just lately, things have opened up, and I am once again listening, and truly feeling relieved by the time spent with your 'sounds'. I recommend the program to anyone who has tinnitus. Thank you so much. And, please, just keep at it! "Thanks to your sound therapy, my bad tinnitus have almost stopped." "In the last 2 weeks I'm experiencing 2-3-4 days in a row literally T free..."
I will continue to listen and treat the T with your product. Seriously Audio Notch team I don't know where Id be right now without your product... Thank you so much for your product and your blog. I post onto the tinnitus talk website as Tintin31 if anyone wants to follow how my Audio Notch treatment has been tracking. I have recommended your product in my posts. After one month there has been a shift in the pattern of tinnitus I am dealing with. This has shifted my mood to a very optimistic one after being very depressed by this affliction. I feel the pro active approach and the results has significantly helped me. Big Thanks AudioNotch! "AudioNotch helped me with my tinnitus." Audio Notch helped me with my tinnitus, It has a lot a variety in treating the ringing and with long term use I believe it is very beneficial at a reasonable price. Currently, there isn't enough evidence to support the routine use of any particular sound therapy for tinnitus. Because Notched Sound Therapy is an active area of research, we don't guarantee a specific volume reduction.